This PDF 1.3 document has been generated by Adobe InDesign CC 2014 (Macintosh) / Adobe PDF Library 11.0, and has been sent on pdf-archive.com on 20/07/2015 at 18:45, from IP address 81.151.x.x. The current document download page has been viewed 299 times. File size: 580 KB (1 page). Your business is no longer restricted by the lifecycle of the onpremise solution; no more upgrading servers or desktop PCs. of opportunities for your business to do more and do it better. any location, using any device, is perhaps the major benefit. make the switch to a hosted desktop? 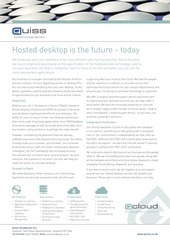 ensures your remaining on-premise technology is supported. provider to achieve ISO 27001:2013 certification. a bespoke Cloud offering, shaped for your business. business. Please get in touch and see how Quiss can help. This file has been shared by a user of PDF Archive. Document ID: 00287230.